On 19 June, my father and I crossed the Ledra Street border to meet our friend Ibrahim from Morphou and his close friend Christos. They took us to meet Tayfun, Ibrahim’s brother-in-law who grew up in Agia Irini / Akdeniz. Tayfun had a bold, yet warm and vibrant presence about him. We met him in his currency exchange shop where he greeted us and then immediately took us out for coffee. The five of us sat there chatting and laughing and soon enough Tayfun and I started the interview. Halfway through, Tayfun’s son Arda joined us and shared some of his stories and hopes for reunification. Tayfun grew up speaking both Turkish and Greek and used to work in his father’s Kafenion when he was ten years old. He knew all of the people of Agia Irini very well. “There are no bad nations, just bad characters”, he said. Tayfun never judged his fellow villagers based upon whether they were Turkish or Greek Cypriot; he judged them based upon their character. Tayfun remembers attending Greek Cypriot weddings, which went for three days and had similar music to Turkish Cypriot weddings. He regularly visited the church to attend weddings and funerals and remembers Greek Cypriots being koumbaro (best men) for Turkish Cypriots and vice versa. His mother was a milk mother “but only for Turks”, he said. The week before the 1974 war took place, Tayfun was working with Greek Cypriots in the building industry, as he wanted to work in a physically demanding occupation that would help him develop “a triangle shaped body” that was highly desirable to the girls. Tayfun had not encountered any intercommunal trouble until the first few months of 1974; however that did not discourage him from wanting to work with Greek Cypriots. When the war broke out Tayfun thought it would only be for a short period. He waited one week for his Greek Cypriot friends to return, then “a month, three months, a year … I waited.” It has now been 41 years of division. Three of his close female Greek Cypriot friends came to visit him in 2003; “We cried together, after 29 years apart”. After he finished high school, Tayfun attended the Middle East Technical University in Ankara where he studied a Bachelor of Science and Economics. 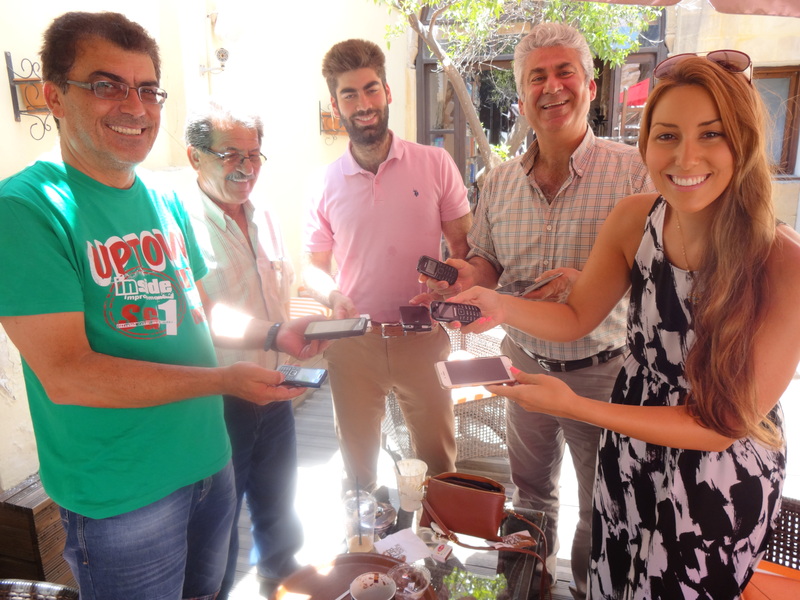 Christos, Ibrahim, Arda, Tayfun, me – with our two phones! He married in 1987, moved to north Nicosia, and had two sons. Although Tayfun now lives in Nicosia he has a summer house in Agia Irini/Akdeniz and visits almost every weekend. Since the border opened in 2003, Tayfun’s Greek language came back to him – he was worried that he had forgotten it. He has since attended many Greek Cypriot weddings and his son Arda told me that he has often had dinner at the houses of Greek Cypriot family friends. Tayfun showed us his Republic of Cyprus identity card. Arda had one too – he said, “Most people whose parents were born before 1974 have ID cards”. Both feel Cypriot and hope for reunification. As we were leaving Tayfun asked for my phone number. I said to him, “Which one?” and held up my two phones; “My Turkish one or my Greek one?” He laughed and pulled out his two phones, and so did Christos. Arda said, “I’m sorry to tell you, but in two months time you won’t need two phones anymore” – as the two leaders have recently agreed to link the phone systems. For the sake of the photo, we had Arda hold my dad’s phone to make it look as if he had two phones, too! Although we did not want to leave, we had another interview set up in Erol’s kafenion in Agia Irini. 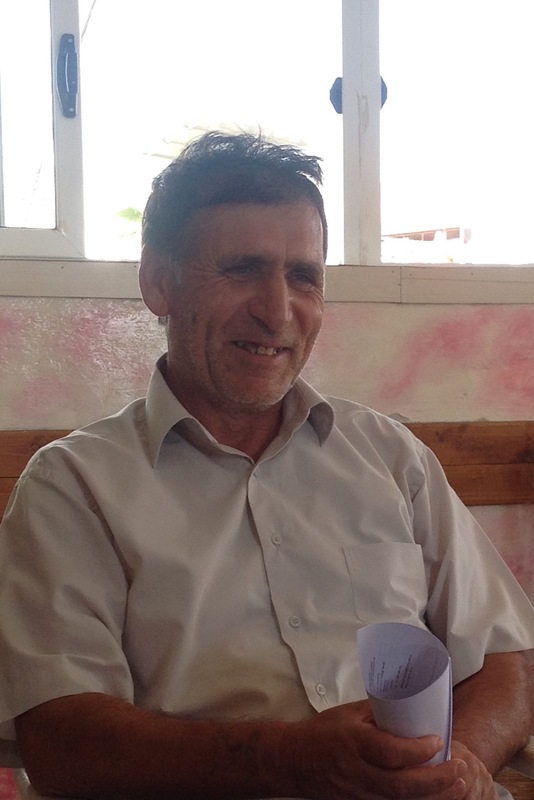 When we arrived the hoca (pronounced ‘hodja’), a lay preacher, was with Erol. I was so thrilled to be able to interview him. Huseyin was born in Pendayia and then moved to Lefke with his family from 1963-1973. They then moved to Agia Irini after his family was forced to leave Lefke. He only lived in Agia Irini for one year before war broke out. He told me that his grandmother was a sut anne (milk mother) for a Greek Cypriot child and in May 2015 a Greek Cypriot man had come to visit Agia Irini and proudly told Huseyin that his wife and Huseyin’s mother are ‘sisters’! Although he only spent a year in Agia Irini with Greek Cypriots he made many friends and attended Greek Cypriot weddings. He also remembers Greek Cypriots attending the mosque and Turkish Cypriots attending the church. As a child, Huseyin had a close Greek Cypriot friend with whom he would often play in the sea. Tragically, in 1974 a tractor crushed the boy when it fell on him; the whole village was distraught and both Turkish and Greek Cypriots attended the funeral. Huseyin only had two years of schooling, and used to get up to mischief with his friends as a teenager and young man. However, as he grew older, he started to question his behaviour and slowly connected more strongly to Islam. He then studied to become a hoca and spent one intensive month learning Arabic – where “it felt like ten years” as he learned so much. He learnt Arabic very quickly and continued to teach himself. Huseyin was very sincere and very kind. He said to me that I seemed like a long lost relative of his; “I am so happy that you have come to visit”. He also said to my dad that he wishes the world was full of good people like my great-grandfather: “The world would be a better place”… Dad’s eyes welled up. In less than one hour we had made deep connections with Huseyin. The call to prayer was heard. 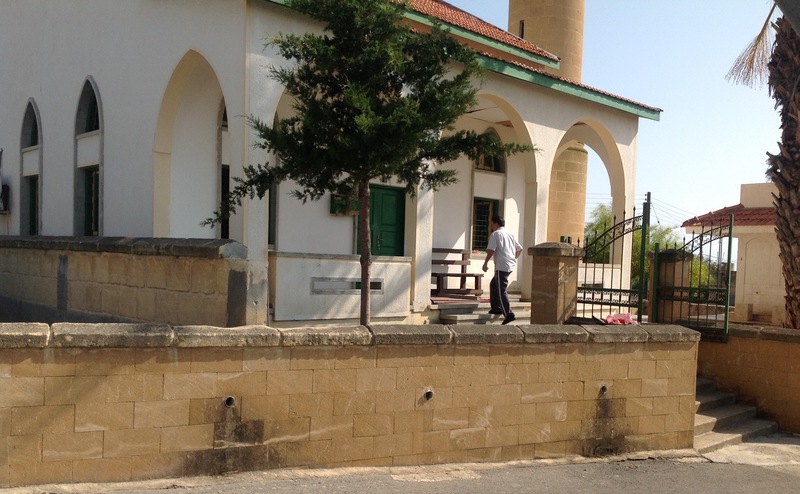 Huseyin made his good-byes and hurried to the mosque.